She owes $59 million. Should she be allowed to vote under Amendment 4? Senators said they were sympathetic to pleas from felons, but voted along party lines on a bill that would make restitution a requirement of completing someone’s sentence. Karen Leicht, who owes $59 million in restitution after pleading guilty to various federal insurance fraud charges in 2010. But she cannot vote — and likely never will — if a bill in Tallahassee gets signed into law. That’s because Leicht, 61, owes $59 million in restitution after pleading guilty to various federal insurance fraud charges in 2010. Under Republican lawmakers’ interpretation of Amendment 4, a ballot measure that passed last year, ostensibly restoring the right to vote to more than a million Floridians, Leicht would have to pay every penny back before getting back on the voter roll. She and other former felons told a Senate committee Monday that this interpretation would mean a lifetime ban from voting, although they’ve finished prison and probation and have worked hard to live an honest life since. Coral Nichols, 40, told senators she owes $190,000 in restitution after being convicted of grand theft. She spent more than four years in prison and nearly 10 years on probation without a violation and now runs a nonprofit helping people with addiction. Coral Nichols, who owes owes $190,000 in restitution after being convicted of grand theft. She says she pays $100 per month toward her restitution, under a judge’s order. She would eventually be able to vote — in 190 years. “I will be someone who will not be registered to vote if you pass this,” she said. Senators were sympathetic to their pleas, but voted along party lines on a bill that would make restitution a requirement of completing someone’s sentence. Unlike court fees and fines, which are mandated by state laws and county ordinances, restitution goes to pay back victims of crimes. Under the Senate committee bill, court fees and fines wouldn’t count against someone’s sentence if the amounts are converted to a civil lien, which typically happens once someone has completed their probation. The committee chair, Sen. Keith Perry, R-Gainesville said he’s been an advocate for Amendment 4 and doesn’t want to hinder anyone’s chance to vote. “This is one of the most transformative and best amendments this state’s ever passed,” Perry said. 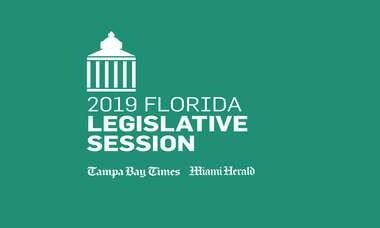 But he and Vice Chair Sen. Jeff Brandes, R-St. Petersburg, said they’re constrained by what it means to complete someone’s sentence, a term that’s in the amendment. 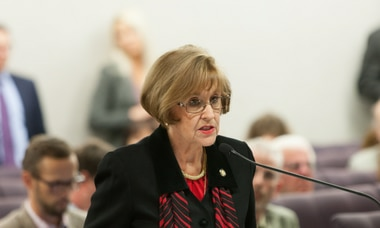 They pointed to testimony before the Florida Supreme Court by University of Florida law school Dean Emeritus Jon Mills, who argued on behalf of Amendment 4. Mills told justices that fees, fines and restitution could all be considered part of someone’s sentence. Brandes also pointed to similar language on the website of the Florida Rights Restoration Coalition, which helped pass Amendment 4 last year. The bill will likely have to pass a few more committees before making it to the Senate floor, and Perry said he was open to reconsidering the stance on restitution along the way. The two Democrats on Monday’s committee voted against the bill. “I just feel like we are essentially telling these folks that they’ll never be able to vote,” said Sen. Randolph Bracy, D-Orlando.